Y'all might recall that I had a little surgical adventure back in November of last year. I would have preferred to wait until summer when the weather turns evil and time outside is necessarily limited by the heat and humidity. The Executive Producer was loath for me to wait, so I acquiesced, not altogether gracefully, given that this surgery required I spend 8 weeks of great gardening weather under serious activity restrictions. What really made me cranky, though, was not getting the results I needed from the surgery. By March it was clear that tweaking was necessary but I was danged if I would miss out on spring gardening. Evil weather arrived in July, as it always does, and I scheduled the follow-up procedure for August 9th. I'm happy to say that improvement was immediate and the restrictions are less onerous this time. But I still had to take it easy that first week. So I was sitting in my comfy chair the week after surgery, feeling pretty good but fed up with the weather and to be quite truthful, the garden as well, at least that which can be seen from the vantage point of the comfy chair. Too little rain and too much heat has the back garden looking pretty sad. I had the Sunday edition of the New York Times at hand and was reminded once again how much I wanted to see a couple of shows in particular. And that's when I got a little crazy and booked myself a flight to NYC, tickets for 2 shows and a night's stay in a hotel for this past weekend. 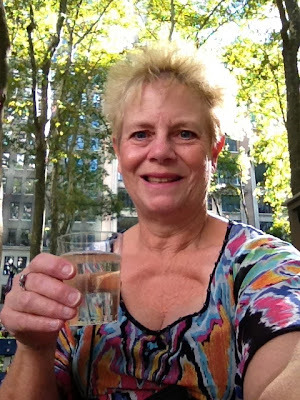 I left Houston at 11 AM and by 3 PM CST, I was sitting in Bryant Park with a glass of prosecco, enjoying cooler air and the delights that only New York can provide. Saturday night, I took myself to the Music Box Theatre to see PIPPIN. What a visual feast: the Players outdid themselves in their dancing and acrobatics. My only regret was that Andrea Martin was on hiatus this month so I didn't get to see her Tony award-winning performance. 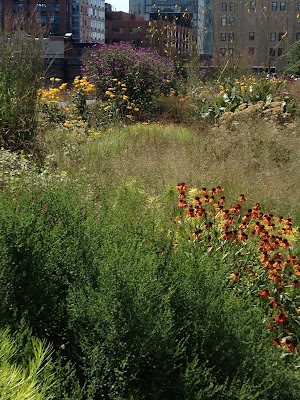 Sunday morning, I had the pleasure of the company of fellow blogger Monica Hemingway of Gardening Products Review, who took the train in from Connecticut so we could visit the High Line together. Although I've been to the High Line on most of my trips to NYC, this is the first time I've seen it in full and glorious bloom. 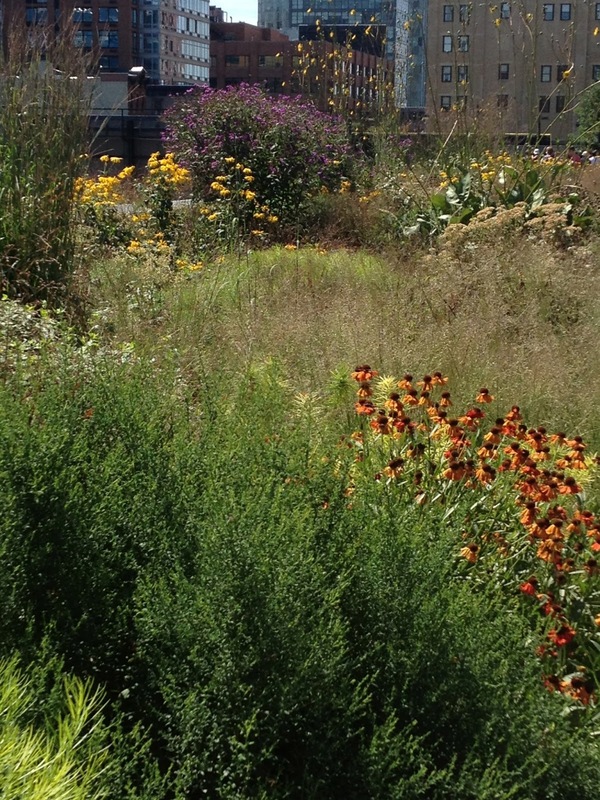 The prairie/meadow wildflower plantings are spectacular, made all the more so for their juxtaposition against their urban setting. So here are a few pictures from my iPhone of the High Line Players, as colorful and varied as those I saw onstage! I can't find this one on the plant list or I don't recognize it. Anyone? 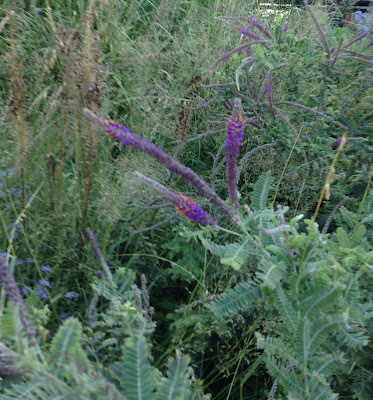 I think this one is Amorpha canescens, Lead Plant. This was probably our favorite planting area. have scraped the ground raw. What a contrast! The Amsonias absolutely glowed! Oh, to get them to do that here. Hello, my name is Cindy and I'm a hopeless believer in lost causes. The rich colors of Helenium 'Rubinzwerg' make me sigh. Monica and I enjoyed lunch at Colicchio and Sons, followed by a stroll through Chelsea Market, before parting ways in the Theater District. I was privileged to attend the final performance of VANYA & SONIA & MASHA & SPIKE and to witness possibly the single most brilliant monologue ever performed, by the inimitable David Hyde Pierce. Christopher Durang's play was hilarious and poignant ... and well worth almost missing my flight home! Wildflower Wednesday, on the last Wednesday of each month, is hosted by Gail of CLAY AND LIMESTONE. 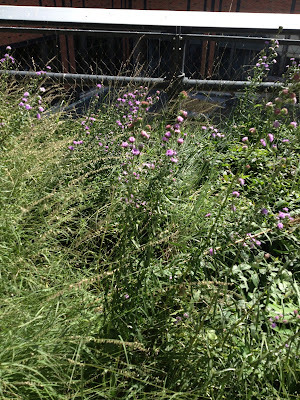 Do stop by her blog and see what other wildflowers are blooming and where! Oh Lordy, I am so jealous! Not just that you saw the Highline again, but the shows too. I love Broadway shows, and haven't been in years. Sorry it was precipitated by surgery tweaking, though. 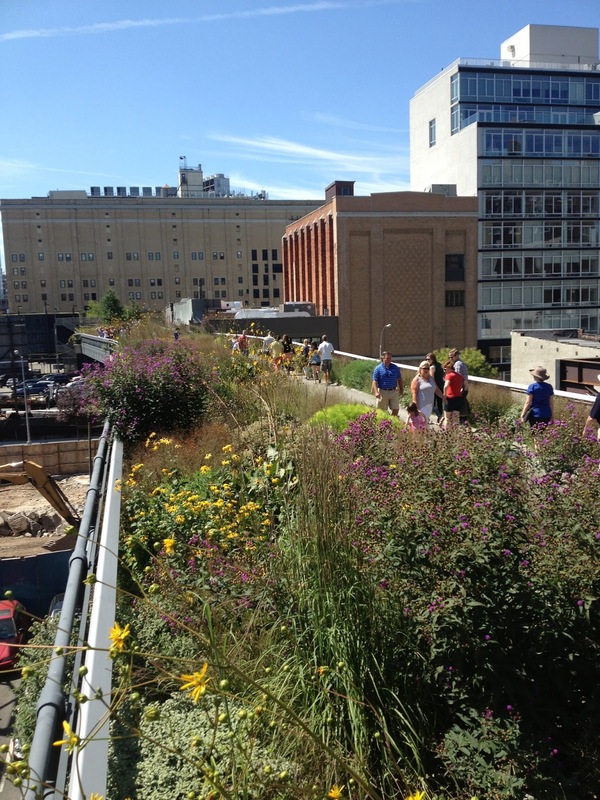 Thanks for the great pictures of the Highline in its glory. You are an inspiration, Cindy! Not only for your bravery in traveling to New York City alone, but for fixing what is broken and then treating yourself to shows, good food and company and a garden created out of a wasteland. Kudos to you, my friend! 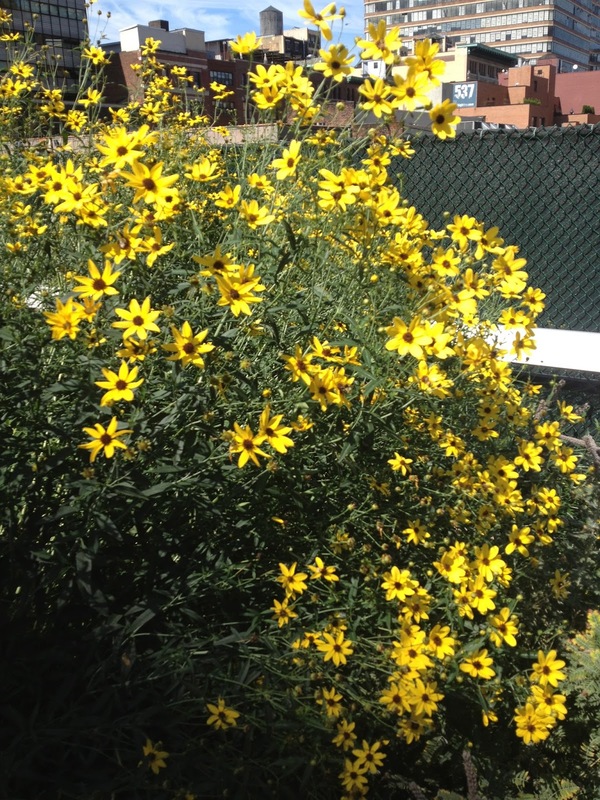 Not being able to see it in scale, my guess is the yellow-flowered plant is either a coreopsis or a helianthus. You managed to cram in quite a bit in that short trip. Oh, my, Cindy! I'm sorry you have had problems with the surgery. I enjoyed reading about your adventure. I don't travel much, but love it when others show photos of places they've been. I was wondering if the mystery flower was a coreopsis, too, but couldn't tell. I hope you heal soon so you can attend to your garden. What a wonderful trip. That should speed up recovery double-time! That yellow flower looks like Engelmann's Daisy (Engelmannia peristenia) to me. I have them growing in my meadow. What a fun spur of the moment adventure. 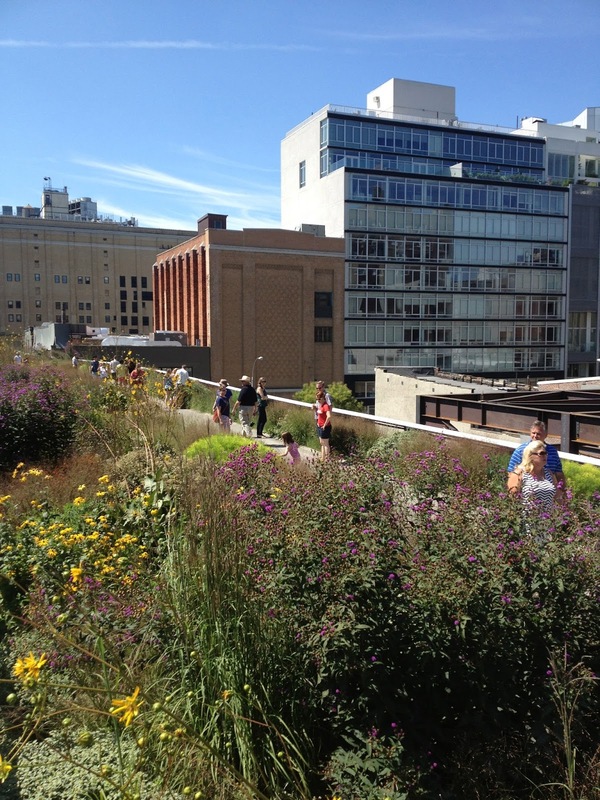 Ever since I heard about the High Line I've always wanted to visit. What a wonderful trip - theater, blogging friend, flowers! What a great way to recuperate! My husband has been recovering from another surgery, and it's been endless Westerns and History Channel on our TV ever since:) Broadway sounds infinitely better! Visiting NYC has been on my bucket list for forever--I'll have to remember to add the Highline to that list as well. 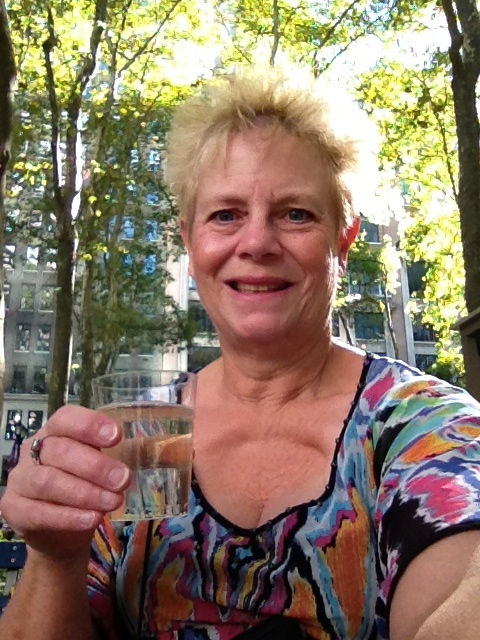 Glad y'all enjoyed my visit to the High Line! It is worth seeing in any season but it was truly spectacular this time. Sandy, forgot to say, I don't think that's Engelmann's Daisy. 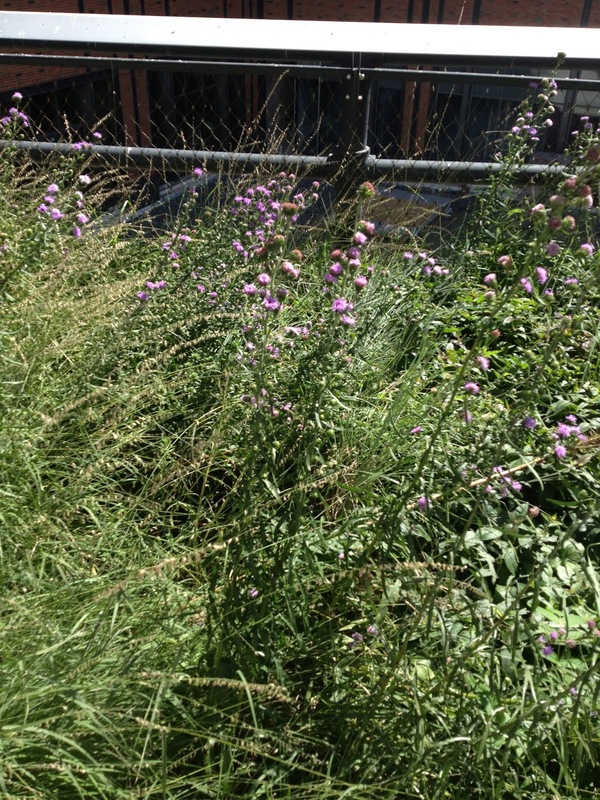 I grow that here and the flowers on the High Line plant were much larger. So now you are traveling to cooler climates for your Wildflower Wednesday posts? Seriously, what a great idea! I can tell you had fun fun fun! Still hot here...so go see New England and the turning of the leaves. I wouldn't come back until Sept. 21st if I were you. That's my prediction for cooler weather this year. I like the way you chose to recuperate. Great gardens in NYC. I'd love to see the changes in the High Line since I was there a couple of years ago. I know it is longer now. You may as well enjoy yourself in other ways if you can't garden! Good on ya! Lovely photos and I'm glad your health is improving.